Do all you can to save the world!" on our Rose Garden webmart. which makes 2 completed scapulars. See below for purchasing link. 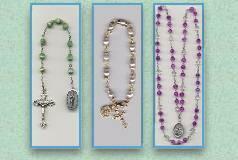 Scapulars may be machine or hand-stitched. 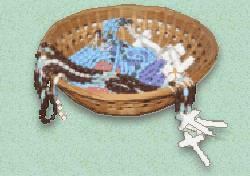 The scapulars are comprised of iron-on and stitched images bound to two layers of wool. Our Kit includes 4 strips of wool cut to 2½ x 5"
about an inch apart and ¼ inch from the top edge of the wool. just the time it takes to say the prayers. the images are firmly affixed. The images will be sewn in place in another step. "Holy Passion of Jesus Christ, save Us"
"Sacred Hearts of Jesus and Mary, protect us." Braided cord is included in our Kit. The ends fray very easily as soon as the cord is cut. about ½ inch in from the top of the wool strip. and press down with fingertips to set glue in place. and the top edge of the wool strips are flush. The other edges of wool will be trimmed away after sewing. as shown in the previous step. Position the image strip over the cord strip and set the glue. Your strip sets are now ready for machine stitching. not stopping between images, as indicated by the dashed line above. Then set machine stitch width to the widest on your machine. Set the stitches per inch to the smallest size. of your stitches is at least 1/4 inch wide. We have highlighted the area of wool to be stitched around the images. 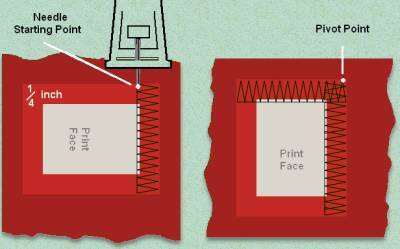 beginning ¼ inch before the image and ending ¼ inch after the image as shown. Stitch across top of wool, keeping the cords straight as you go over them. Leave the needle in place at that last stitch, raise the presser foot, and pivot the wool strip to align the right side of the image for sewing. Continue stitching all four borders; backstitch as usual over the starting point to knot off. being careful not to catch stitches with the blade. Cut 2 layers of wool 2 x 2¼" for each scapular image. You may iron on images first to secure in place. With white thread, sew images to top layer of wool. place sewn top layer on bottom layer, centering image over cords. Let dry before sewing border stitches. as well as other Beginner Kits on our store.